The term 'pantry clock' is one we don't often see and its use it a little bit arbitrary. 'Pantry' is an old-fashioned, even obsolete, word which today can mean different things to different people. I looked up the word in an old dictionary of the early nineteenth century and was told it was ' a place where victuals are kept'. Victuals is probably as old a word as the pantry they were kept in! Today I suppose we should call victuals food or provisions. When I was young our pantry was a cupboard with shelves to hold a couple of jars of jam and a tin of peaches mum had saved for after the war. Ours was located close to the kitchen and was barely big enough to contain a bread bin, let alone a clock. The pantry in 'pantry clock' refers to something altogether grander, meaning the provisions area and staff quarters of a large gentleman's house. It probably encompassed the various passageways, storerooms and rear or tradespersons' entrance, perhaps even including the kitchen itself. It was the servants' working area and maybe even ran as far as their accommodation rooms above. So a pantry clock was one made for the staff quarters in the house of a gentleman of some quality. Other types of small wall clock, such as a hook-and-spike clock or a hooded clock, are sometimes mistakenly called pantry clocks, and could well have been used in a pantry, but this term is more correctly used to mean the type of clock with dust covers as pictured here. Of course it was perfectly possible for the householder to buy a modest type of longcase clock for such a purpose, and no doubt some did. But I always think of a pantry clock as being the sort of clock to hang inconspicuously in a passageway in such a position that it could he heard in those rooms containing the staff. A longcase would have taken up needless space, which was at a premium when servants were scurrying along corridors carrying trays bulging with half a dozen roast swans. 1. Pantry clock of about 1760 by John Green of St. Martin's Court, London, on a wall-mounted shelf. Verge escapement. Alarmwork. Dial pictured after restoration. Closer view. But a pantry clock usually had a feature which the longcase generally lacked, and that was an alarm. They were usually non-striking, but had a loud bell which rattled off the alarm at pre-determined times. The alarm put an end to any excuse for lateness. An alarm could be built into a longcase clock, and sometimes was, though alarming longcases are unusual. But in a pantry clock the alarm bell was open to the air, not muffled by being boxed inside a wooden case, and the point of that was that it was therefore much louder! What was even better, a pantry clock was much cheaper than a longcase, but still had the reliability of being weight-driven like a longcase. It was massively cheaper than a spring-driven wall clock, which anyway were a little temperamental and less reliable at timekeeping. So, for an employer of servants the pantry clock was the ideal way to go. Not only was it space-saving, easy-going, reliable and accurate, but it had a loud alarm. All those requirements the ruling classes sought, and cheap too! Clockmakers must have sold them by the thousand. There were other types of low-priced weight-driven clocks, which could have alarmwork and which hung on the wall. These were the lantern clock, the hook-and-spike clock, and the hooded clock. Each of these types could have been bought by the same clientele for the same purpose, and no doubt they often were. The lantern clock hung from a wall hook or sat on a shelf and was fairly showy with fancy brass castings and turnings - needless frippery and needless cost when for the use of servants. The hooded clock had its bell boxed in, like the longcase, and therefore muffled, and again was perhaps a bit smart for the pantry - though there are some very modest ones. The hook-and-spike clock was rather like a simplified lantern clock, but like it too, it was exposed to dust in the atmosphere, and there might be plenty of that being tramped in by tradesmen in muddy boots. The pantry clock on the other hand, not all of them but at least the 'better class' of pantry clock, had sliding dust covers, which kept the dust out - another blessing as it would save the cost of needless clock cleaning. To the gentry and aristocracy the pantry clock was in fact a godsend! So that was it - a small weight-driven clock, which sat unobtrusively out of the way on a shelf, didn't get dirty, had ideally a verge escapement and short pendulum and so was not fussy about being level, was boxed in with sliding dust covers, which also kept it safe from poking fingers, and had an alarm that was simple to operate. Just turn the alarm disc to align the desired time of awakening alongside the tail of he single hand, and pull the small secondary weight to wind the alarm section. 2. Movement of the John Green clock showing the sliding brass dust covers to keep the movement dust-free. Closer view. 3. 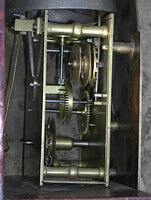 Movement of the John Green clock with the dust covers removed showing the verge escapement and short pendulum. Closer view. But why, since it offered so many benefits so cheaply, do we so seldom see one? We see them now and then but nothing like as often as lantern clocks, or hooded clocks, or hook-and-spike clocks. I don't know the answer as to why, but I can think of one or two possible reasons. Firstly pantry clocks don't really begin till about 1700. Before that one supposes that lantern clocks fulfilled the same function. They seem to have been seldom made after about 1800, and by the mid 19th century had been replaced by the now cheaper, spring-driven alarm clock of the bedside type. But that still leaves the best part of a century during which they were made, and there should be plenty of survivors. Well, there probably are. A good many may still be in their original locations, in stately homes some open to the public, some not. Perhaps many were traded in by their owners in the past, when newer clocks were bought. Clockmakers of all eras would always be willing to take an old clock in part exchange, just for the sheer value of metal content, and especially one with such a high proportion of brass parts - for brass always had a high value. And a good many that survive today will be in the hands of collectors, for whom this type of clock fills many aspirations. Pantry clocks could have been made by clockmakers anywhere in the country, but in fact the majority were made by London-based clockmakers. Why should this be so? Well, many gentlemen liked to buy their clocks from London, where their ladies bought their frocks. It was well understood in the circles of higher society that the best of everything was to be found in London. Whether it was true or not, that was the belief. Gentlemen bought their household clocks there, and whilst ordering a fine longcase or a few bracket clocks, they also ordered a pantry clock or two from the same maker. Few London clockmakers were botchers, and the result is that many pantry clocks were beautifully made little clocks of fine quality, even if of a modest nature. Some were even made by clockmakers who today are highly thought of, though generally known through clocks of a much grander nature. This is another incentive for the collector, who might in this form be able to own a modest clock by a celebrated maker, whose grander work would be beyond his means. There are several reasons why pantry clocks were almost tailor-made for collectors of today. Small, beautifully made, easy-going verge escapement, boxed in with dust covers, with alarmwork - and, perhaps best of all, today, quite rare! This is almost a prescription written out by a collector for those features he would most like to possess. And with a pantry clock all these attributes come in the same package, making it a perfect collector's clock. Let's keep looking for more.